As trends such as additive manufacturing, autonomous vehicles, electrification and 5G connectivity rapidly evolve, companies are under continuous pressure to develop and deliver next-generation products faster and at lower cost. ANSYS 19.2 helps companies meet these demands by solving their most difficult product problems faster and with greater accuracy. ANSYS’ Pervasive Engineering Simulation solutions include new, efficient, single-window workflows and patent-pending advanced meshing technology for computational fluid dynamics (CFD), new processes for developing embedded software for safety-critical applications, and dramatic computational speed and user experience improvements for solving automotive radar scenarios, digital twins, 3D design exploration and structural modeling. With this latest release, companies can confidently make critical product decisions, push the boundaries of innovation and accelerate time to market – without sacrificing quality. Concept development is all about trade-offs between different designs. ANSYS Discovery lets you explore more concepts faster than ever before in any engineering tool. In ANSYS 19.2, parameter studies become an interactive experience that give you more insight faster. With minimal setup and run time, you can delve deeper to test new ideas, learn more about simulation results and better understand the trends and trade-offs between design goals. ANSYS 19.2 delivers powerful new analysis capabilities for designing wireless communication, autonomous and electrification technologies. New features include ADAS/automotive radar, large-target radar cross section (RCS) analysis, integrated electrothermal analysis, an innovative electric machine design kit and new hybrid simulation techniques for printed circuit board (PCB) analysis. Additionally, comprehensive system modeling capabilities are now included with all electromagnetic field simulation products. These provide a multiphysics, multi-technology-based workflow that will spur your engineering innovation to surpass your competition. ANSYS SCADE has powerful new capabilities that will make it easier and faster for you to design your embedded system architecture and develop and verify your safety-critical embedded code. ANSYS SCADE Suite contains improvements to both the design verifier and the Simulink importer. An important new feature in ANSYS SCADE LifeCycle is the addition of Jama from Jama Software to our supported requirements manageability tools. You can now export SCADE artifacts as surrogate models in Jama, enabling bidirectional generation of matrices. Rounding out the new features in the latest version of SCADE is the addition of the No Magic MagicDraw SysML importer for ANSYS SCADE Architect. Many systems engineers use MagicDraw to design their high-level systems, and now they can easily import these diagrams directly into SCADE Architect. 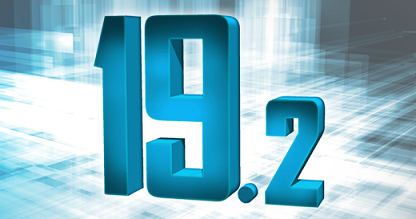 ANSYS 19.2 is filled with new features that will accelerate your computational fluid dynamics (CFD) simulations and boost your productivity. ANSYS Fluent now offers a task-based workflow for watertight geometries that supports patent-pending Mosaic meshing for more accurate flow resolution. Newly available ANSYS EnSight Enterprise is a powerful, post-processing and simulation visualization tool. ANSYS 19.2 introduces System Coupling 2.0, an updated version of our multiphysics coupling engine. Now you can leverage high-performance computing (HPC) resources to map your data signifcantly faster. In this latest release we are introducing ANSYS SPEOS as part of the ANSYS Optical solutions family. SPEOS lets you design and simulate illumination and the optical performance of systems to save on prototyping time and costs. The latest version of ANSYS Mechanical offers more simulation options than ever, with new inverse analysis, enhanced materials modeling and topology optimization developments. Hot-to-cold (or inverse) analysis can accurately calculate the "cold," or unloaded, shape to achieve the desired “hot” shape and performance during operation. The new Material Designer feature can create detailed models of fiber-filled, woven or lattice materials, and then calculate equivalent properties for use in larger scale simulations. In topology optimization, ANSYS 19.2 has additional loading options, manufacturing constraints that are ideal for additive manufacturing, and a unique lattice optimization capability. The ANSYS Systems family has new features and functionalities in ANSYS 19.2 that are essential for the development of digital twins, autonomous vehicles and electric vehicles. New capabilities included in ANSYS Twin Builder make it easier and faster to build, validate and deploy digital twins. Now you can visualize 3D fields of static reduced order models (ROMs) in Twin Builder and view simulation results like velocity and flow rate on the 3D geometry. We've also enhanced our Modelica library for battery cell modeling. ANSYS medini analyze includes new functionality that improves workflow and speeds development of semiconductors, specifically those used in the automotive and autonomous vehicles industries. This solution helps semiconductor manufacturers in the automotive domain with dedicated ISO 26262 support to meet safety regulations. Finally, our new ANSYS VRXPERIENCE solutions have been bundled to satisfy your virtual reality (VR) simulation and validation needs for interior and exterior lighting, autonomous vehicle (AV) simulation and lidar in one package.